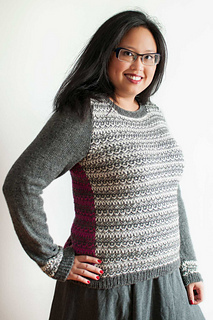 TERRITORY is a cozy, stylish pullover with a pretty, easy slip-stitch colourwork pattern. It looks complex, but you’ll only be working with one colour at a time! 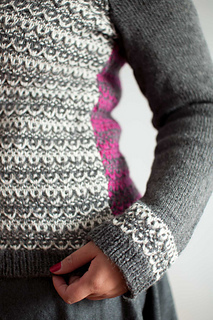 The Frieze pattern is echoed on the cuffs, while the rest of the long set-in sleeves offset the patterned body with simple Stockinette. The pieces are worked flat from the bottom up, and seamed before adding the ribbed collar. 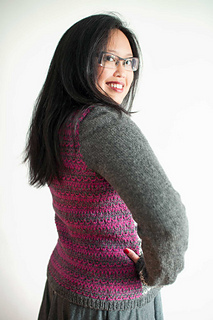 I’ve used a surprising hot pink for the contrast colour on the back, for an update to a classically styled sweater. Meant to be worn with -1 to 2” / -2.5 to 5cm ease at the bust. 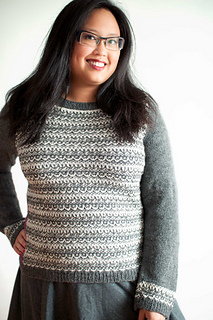 For the best size, measure a sweater you like the fit of, and make the size closest to it. Shown in size 41” / 103cm with zero ease. Technical editing by Alexandra Virgiel. 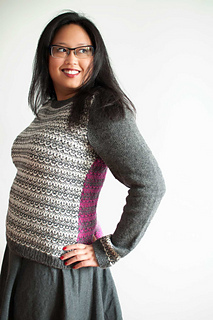 7 page PDF pattern includes schematics, with measurements given in metric and imperial. 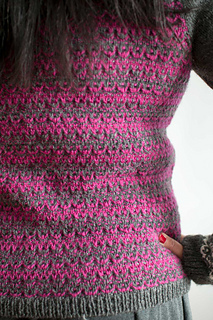 Slip-stitch colourwork pattern is written only.